There’s still hope left for fans of Pitch and The Exorcist. Recently, FOX chairman Gary Newman and entertainment president David Madden discussed the possibility of a second season for both TV series, Deadline reports. Both shows ended their freshman seasons this past December, earning lower-than-expected ratings. 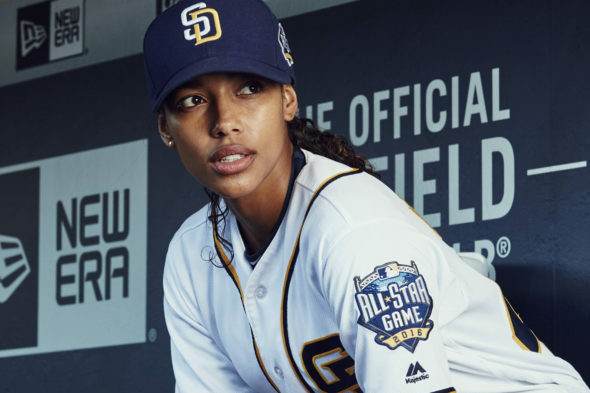 Pitch, which stars Kylie Bunbury as the first female player for Major League Baseball, averaged a .83 rating in the 18-49 demo and a total of 3.032 million viewers. The Exorcist, which is based on the classic 1973 horror movie, brought in even lower ratings, with an average rating of .68 in the 18-49 demo and only 1.914 million viewers. We’re proud of it [Pitch].Dan [Fogelman] and his team did a great job. We’d love to have seen a bigger audience, but it had a loyal core fan base, and there was a lot of delayed viewing. The show is specific; it’s about something. What do you think? Do you watch either FOX series? Do you want a second season for both? More about: FOX TV shows: canceled or renewed?, Pitch, Pitch: canceled or renewed?, The Exorcist, The Exorcist: canceled or renewed? The Exorcist: Season Three; Would You Watch More of the FOX TV Series? The Exorcist: Cancel or Renew for Season Two? The Exorcist: Cancel or Keep the FOX TV Show? Pitch: Cancel or Keep the FOX TV Show? Please bring Exorcist back love show so much hate see be cancelled for season 2. If got low rating maybe put on another day so be better to get more view because lot of people have lot of show watch. I do and I love them all. The Exorcist is the best horror-themed show on any of the broadcast networks. I really hope it gets a season 2. I realize its not for everyone, but they didn’t loose viewers at all, menaing it has a very stable fan base. Not everything has to be big bang Theory. Please!! The Exorcist! I absolutely adore the show. Please renew this series! Pitch is an awesome show. A bit of insight into the major leagues but much more… Great acting makes the characters actually “live”. You actually find yourself rooting for Ginny’s success on the mound, Mike being able to finish out his career in style, and they & other key characters to make good choices… both personal & professional. Thus I’m “pitching” for this show to continue! Haven’t been so excited about a new show in a long time…please keep it! I’ve told so many of my friends about it! Love both shows. Especially the Exorcist. It was really freaky and had a good storyline. Please renew!!!!! My husband and I both love the show!! Please renew!!!!! I’m leaving a comment on the Exorcist. Please don’t cancel the show. It has a great cast and I look foreword to see a second season we don’t have shows like this and it’s a great show. So I’m asking you PLEASE DON’T TAKE IT AWAY FROM US GIVE US A SECOND SEASON. I love Pitch. FOX – your fans are here. I’ve never written on a board before. Only the hope that this message will help secure a second season has me writing in public. I thoroughly enjoyed watching The Exorcist, it’s a great show. The writing was well done. I would really like to see it get renewed!